A bird's eye view on the drought. It’s not you; it’s hot in here. The Earth is experiencing some of the warmest days on record; 2018 is expected see the fourth hottest summer ever observed. Beginning in June, simultaneous heat waves were recorded in Japan, Greece, United States, Ireland, Canada and Sweden. Many nations were hit with particularly sweltering days in July, resulting in temperatures that stand out statistically. Japan, Finland, Canada and Sweden saw more daily heat records broken last month than during any other July in the last decade. As explanation for the abnormal heat, climate scientists point to a slower jet stream and arid land that reduce the earth’s ability to cool. A collection of high-speed winds moving in concert, jet streams envelop the Earth. Their meandering paths and rotations create predictable weather patterns. When the arctic and antarctic poles warm, the large oscillations of the jet stream slow down. The United Kingdom, a region along one of the northern trajectories of the jet stream, has seen a dramatic example of this effect. As the jet stream slowed, the UK experienced droughts visible from space. The UK received significantly less rainfall than normal. Central Southern England saw just 3.0 mm (0.12 in) in June. That’s just 3% of normal. The agrarian landscape of Ireland and Great Britain has dried up in the summer’s heat. The drought parched the land so severely that historic landmarks could be seen from above. Structural foundations like castle walls, bronze age cemeteries, and hidden henges were revealed in this drought-powered phenomenon. 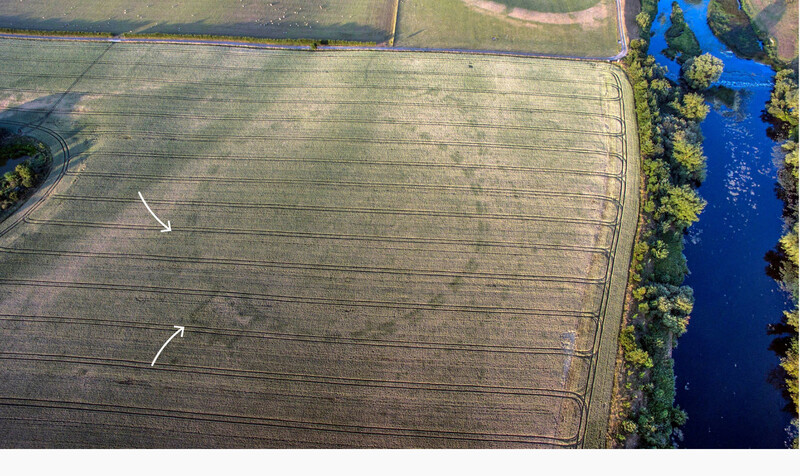 The henge appeared near Ireland’s Newgrange historical monument. The site is known for neolithic tombs formerly constructed to align with celestial bodies. Among these relics, the drought revealed a potentially newly discovered foundation. Drought conditions across the UK can be observed with satellite imagery too. These images from ESA satellite Sentinel-2 show the landscape turning from green to brown. Satellite images like ones above simulate the colors people see on earth. We can also visualize the moisture level of the landscape using sensors on the satellite. A moisture index like the one below confirms the drying landscape. Meanwhile, low rainfall and high temperatures like these make excellent conditions for wildfires. Places like California are seeing longer wildfire seasons. In higher latitudes like Sweden, governments are battling wildfires at unprecedented scales. Over fifty wildfires burned across Sweden on July 25 when the Swedish Armed Forces resorted to using bombs dropped from fighter jets to extinguish the flames. The laser guided detonations were expected to smother the fire by consuming nearby oxygen through combustion while extinguishing the flames through the explosive wind. It was an multi-national effort to contain the flames. As the fires have died down firefighters from Poland, Germany, Italy, Norway, France, and Lithuania have been sent home with Danish crews staying until August 25. The largest of these fires burned outside of the village of Fågelsjö and consumed over 250 sq km (100 sq mi). Below, the extent of the burn scarring can be seen with sensors that capture near-infrared light. These fires burned away from densely populated areas consuming valuable farmland. The Swedish government requested $34.1 millionin support for impacted area from NATO, as well as a proposed $137 million in aid for farmers hurt by the drought and fires. The fire’s aren’t just in Sweden. There have been 11 fires inside the arctic circle this year. Arctic nations can expect higher rates and wider swaths of damage due to wildfires, as a result of a warming planet. In Japan temperatures have reached as high as 41ºC (105ºF). Combined with a torrential downpour and flooding, Japan has had the most weather related deaths this year since 1982. In July, over 220 were killed by flood waters or landslides, and 116 died due to extreme heat. NOAA’s ocean temperature abnormalities over the last four decades show the warming trend. The extreme weather events are not necessarily caused by a warming planet, per se. Climate conditions are thought to shift the bell curve of expected weather patterns. This makes intense weather more likely. Are Europe’s heatwaves being affected by climate change?